Stop-and-waste valve must be 4.5- to 6-feet deep. Approved Reduced Pressure Backflow Prevention Assembly (RP BFPA) must be installed 5 feet downstream from the meter pit/vault, or a maximum of 10 feet with the use of a stop-and-waste valve. RP BFPA must be at least 12 inches above the concrete pad (not shown; located inside enclosure). RP BFPA enclosure (heated or non-heated), with service line address posted. Drain valve/control valve must be a maximum of 2 feet downstream of RP BFPA. Concrete pad must be 4 inches thick. Top of concrete slab must be 1 inch above finished grade. Branch lines for domestic use, as outlined in the Denver Water Engineering Standards (see Chapter 5), are not allowed off irrigation service lines. 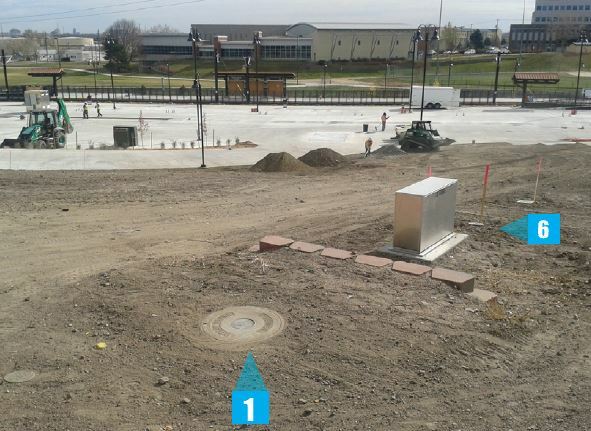 For all service lines 2 inches and smaller, service line material type must be installed, as required in Denver Water Material Specifications (MS-24), to the upstream side of the stop-and-waste valve. 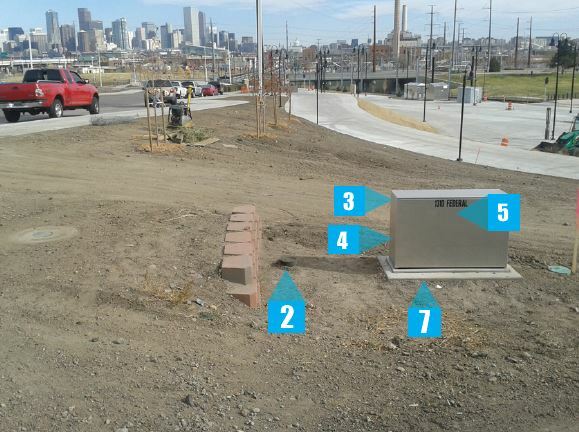 Once downstream of the stop-and-waste valve, service line material type must be provided as required in Denver Water Standard Details (Sheet 68).